Calcium is an integral part of vascular health. Interestingly, calcium has the ability to embed itself into the walls of blood vessels, and this can prove to be problematic if it occurs in excess. As calcium begins to accumulate along vascular walls, it can cause two problems. Calcification of the vascular wall can cause arteries to harden. This is detrimental because the elasticity of arteries plays an essential role in many physiological processes. Calcium accumulation can also cause the build up and formation of plaques. 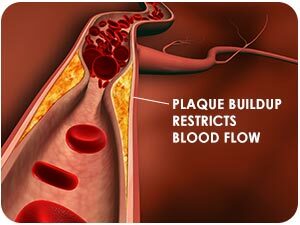 These plaques can cause blockages and eventually lead to heart attacks or strokes. The way Vitamin K2 prevents calcification is by interacting with other proteins to modify a protein called Matrix Gla protein (MGP). MGP inhibits calcium from hardening and building up on arterial walls, but without Vitamin K2, the modification process will not activate MGP. Evidence of this is observed in patients who are deficient in hemodialysis. These patients have severe complications of vascular calcifications due to a low level of active MGP. A team of medical doctors looked at 53 patients with hemodialysis deficiencies and severe arterial calcification.22 They supplemented these patients daily with 135µg and 360µg Vitamin K2 and found remarkable improvements. They found significantly lower levels of inactive MGP, and more importantly, decreased calcification of patients’ arteries. For reasons that are still currently being elucidated, post-menopausal women have problems with coronary calcification. In a study conducted in Europe, scientists observed 564 post-menopausal women and found a direct relationship between VitaminK2 consumption and reduced coronary calcification.23 The authors go on to propose Vitamin K2 as an important preventative solution for cardiovascular disease.